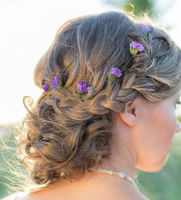 Do you have your wedding hair stylist on speed dial? We picked our TOP 25 Favorite braided wedding hair ideas and put them together for you to drool over!! Have fun! 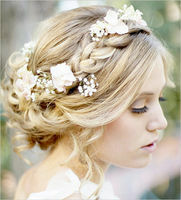 Anna Sophia Robb dons this braided up do perfect to pin for your wedding day hair ideas. See more on Beauty Editor here. 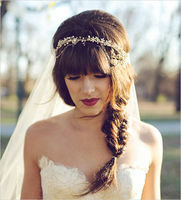 This fishtail bridal look is leaving us speechless. You'll absolutely have to see more of this Luxe Bohemian Wedding. Photography by Amy Nicole Photography. See more stunning looks from this lovely bridal brunch inspiration here. Photography by Margherita Calati. 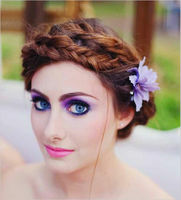 This look by Barefoot Blonde is just the start to her braiding talents among many others like looking fabulous 2-4-7. You'll love these rustic details and find out they have an affinity for books! Photography by KMI Photography Inc.
We love these twisted tresses with soft braids throughout for you blondies wanting to add texture to your easy breezy beachy look. Go see more of the Cape Cod wedding full of details here. Photography Vienna Glen Photography. This bold braided look is polished yet wispy and is a sure way to make a statement. See more bright and beautiful looks from this Springtime Soiree here. Photography by Tina Chiou Photography. 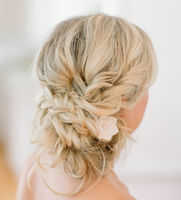 This pulled back braid is for those who can't fathom bangs or hair in their way on their wedding day. You can see more of this casually beautiful South African Wedding here. Photography by Fiona Clair Photography. Loving this? See more of this bohemian bridal inspiration here. Photographed by Lindsey Orton Photography. This braided chignon tutorial by A Beautiful Mess is perfect for everyday or to inspire your bridal look. And we are digging her fire red hair color. 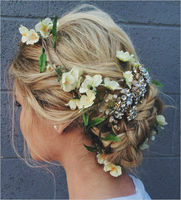 If you have uncertainty about rocking a statement floral crown you can tuck small flowers into your braided wedding up do for a similar look. See more of these Boho Chic Wedding Ideas that will give you the urge to jet off to somewhere exotic. Photography by Filda Konec Photography. Emma Watson donned a polished braided bridal look in Vogue Italia in 2008 and we couldn't be more thrilled that beautiful braided looks are still going strong. Photographed by Mark Seliger. 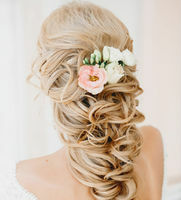 This curled wedding hair subtly resembles a braid for that over-the top-glamorous look. See more of these Fabulously Glam Wedding Ideas and pick out some bling while you're there. 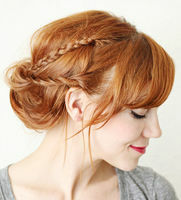 We are a fan of this braided look because it is packing some serious volume. Flat hair on your wedding is a no no so check out this tutorial from Keiko Lynn for detailed steps to get this gorg look. 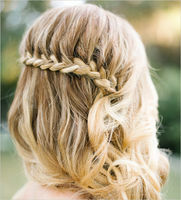 This cascading braid wedding hair look keeps your locks tamed and still allows for a relaxed do. We could go on gushing about this bridal look forever so see these Patriotic Wedding Ideas here. Photographed by Jenna Bechtholt Photography. This look speaks absolute romance. 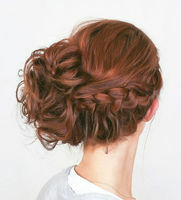 Wouldn't you love to create this up do for your wedding day? We so would! Photography by Ciara Richardson. Don't mind Julianne Hough- she is just being perfect as always with this high and tight knotted braid look. Glamour seems to agree with us. Photography by Getty Images. As if the entire universe doesn't already LOVE Frozen... This bride nailed Elsa's look! 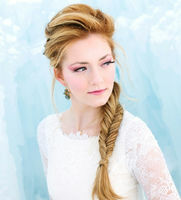 See this fishtail wedding hair at this Frozen Inspired Wedding that took place at the Ice Castles in Midway, Utah. Photographed by Meredith Carlson Photography. 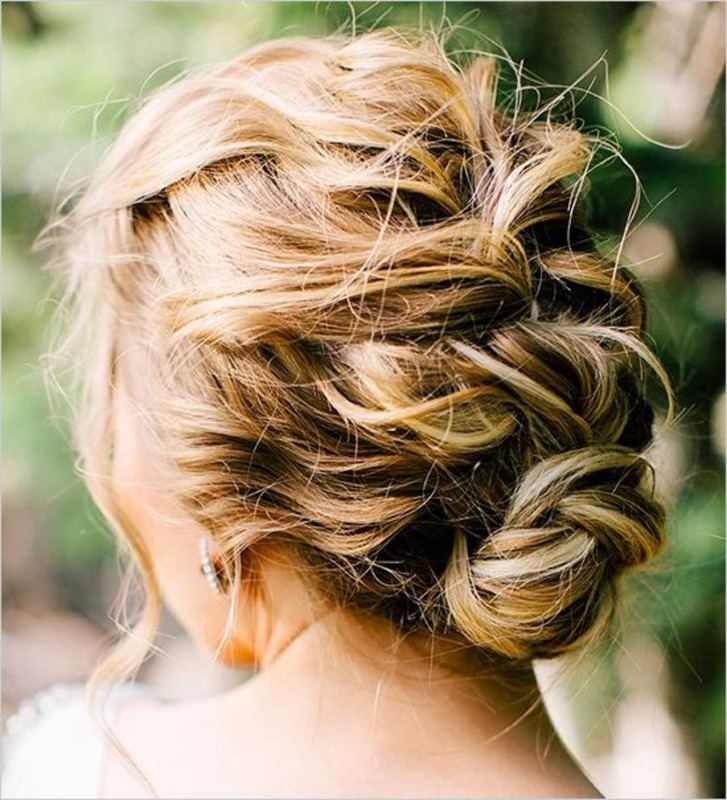 This messy and still adorable braided wedding look is your next DIY. 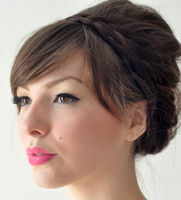 Want to rock this side bun soon or test the waters of this bold idea for your bridal look? Check out the full tutorial from Wonder Forest here. We love a chunky braid that creates a crown. What is more perfectly executed than this bridal look captured for the 2014 Couture Bridal Claire Pettibone Collection?? Photographed by Elizabeth Messina. 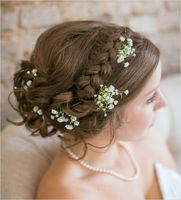 This bride looks flawless with her teased and pinned braided wedding hair. See the details of this Book Lovers Dream Wedding that leaves no details to spare. Photographed by Jenna Petersen. 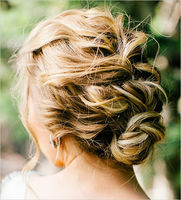 Magical winter Wedding Ideas like never before including this dramatic twisted and braided ponytail bridal look. Photographed by Shalynne Imaging. Add glitz to your glam by weaving metallic ribbon through your braided tresses. More rockin' Silver Wedding Ideas to fall in love with here. Photographed by Feather & Twine Photography. This super cute knotted do cranks up the cuteness at this Hawaiian Wedding full of destination desired details. Photographed by Wendy Laurel. This softly curated tousled braid is perfect for your undone bridal look. See more of this goodness here. Photographed by Rylee Hitchner Photography.